This is no ordinary cookbook. 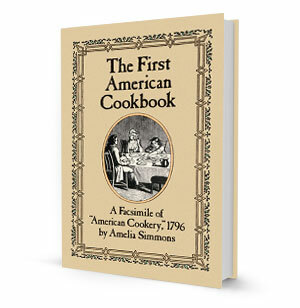 It's the first American-written cookbook published in the U.S., and it reflects the cooking techniques, eating habits and archaic language that was all the rage back in the 18th century. Impress your friends with tasty dinners and a savvy dollop of history as well. Get ready for stew pies, roast mutton, Johnny cakes and spruce beer-guaranteed to be as delish today as they were for wig-wearing new Americans. Get down with dinner, colonial America-style. Rich in History and "Flavor"